Imagine having a perfectly tempered home, cool in the summer and nice and toasty in the winter, with no utility costs. 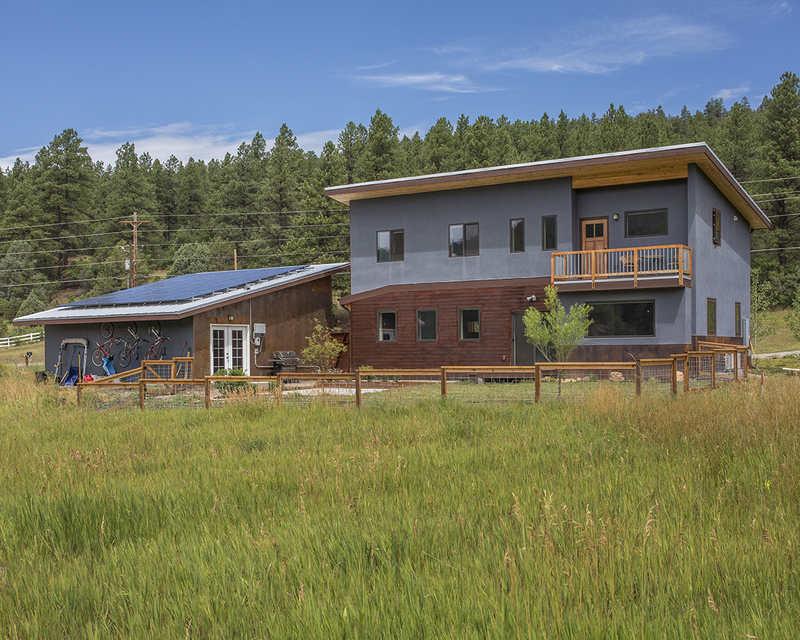 Check out Tim DiBerardino's net zero home at 4214 CR 240 just minutes from town in Durango, Colorado. Set on a little over one acre this 1800 sf home boast no power bills. "The future is here with new residential building techniques. Building a home that provides all the modern day amenities and no power bills has never been easier or more affordable. This home on Florida Road just a few minutes from the town of Durango shows just how easy and affordable that is! Please keep in mind two things when reading all the technical information below. One, that you can still use as much power as you want at any time of the day or night. Second, that the systems used are actually more simple and easier to maintain than just about any conventional home. Also, the new construction cost per sq. ft. is equal to any other comparable new built home in the area. All the information and building products are on the market now for us to use. We just have to implement them in a strategic way! Here is how it works and some of the amazing custom details that come with it. All of the rooms face south and the house is oriented for optimal passive solar design. State of the art technology and a 7kW PV solar system help to create a home that produces more power than it uses. The extra power produced can be sold back to the power company once a year or used to power other items. The home is super insulated with double-wall construction, foam under slab and roof, and triple pane windows produced by Alpen in Boulder, CO. Other Green contributors include LED lighting, energy star appliances, heat pump hot water, Mitsubishi mini-splits and insulated blinds. All of these elements help produce a home with superior comfort that is quiet, cool in the summer, and warm in the winter. The 3-bedroom, 3-bath home boasts a large open living/dining/kitchen on the main level, a detached 2-car garage, and a grid tied solar system that provides 100% of the homes energy and heating needs. It rests on one acre in a peaceful valley with stunning views, privacy, less than 2 miles to Durango city limits and only 3 minutes to Bread! The interior is light and bright with custom craftsman details throughout, including a bamboo/slate staircase, acid-stained concrete floors, wall sconces, custom bath vanities and much more. The master suite features a private balcony and travertine/glass shower. The kitchen features bamboo cabinets, recycled PaperStone countertops, walnut bar top, repurposed pine shelves and stainless steel GE Profile appliances with an induction top range. Water and Sewer are part of the Ute Pass Water Association provided through the City of Durango. The exterior of the home features low maintenance stucco, Trex decking, and a ground level concrete patio. A portion of the backyard is fenced and the property has several maturing trees. There is no HOA and plenty of room for your kids to play and to house all the boats, bikes, toys, gardens and up to four horses. Walk through the backyard to explore a trail up Raider Ridge extended or a short stroll to the swimming pond in Ute Pass Subdivision. The garage has a lot of space for extra storage. Average monthly utility costs are $83 including water and sewer, with the opportunity to be paid some back by LPEA. * Mitsubishi Split-System Heat Pump – Mr Slim Hyper Heat- these are some of the most efficient units in the industry, and provide heating or cooling as needed. * PaperStone countertops in the kitchen are a made out of recycled paper. * Xeriscape landscape for minimal yard care"
More information on this cool Net Zero Home listing at 4214 CR 240, Durango, CO - call Claudia for a showing! Fun Fact: Did you know that Claudia Williams is Durango's first EcoBroker? Trained in helping people buy and sell green and energy efficient homes.